When it comes to swinging a golf club, you might think there is only one way to swing in order to be successful. That there is simply a right way and a wrong way and there is no in between. 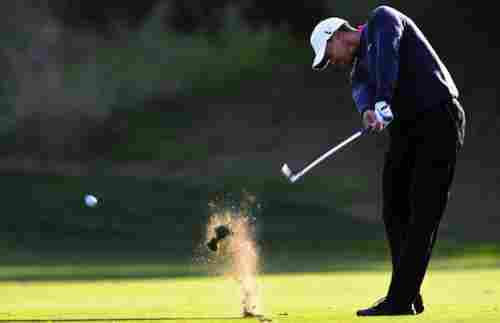 However, this is not the case; every pro golfer has a very unique swing which is based upon a litany of factors. Every pro golfer spends hours a day working out even the smallest tweak within their swing to help give them an advantage when facing any challenging hole or course. 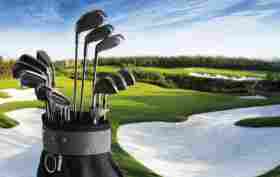 Since most non-pro golfers do not have the time to swing at a couple of hundred golf balls a day, you will need some tricks and tips in order to figure out how to swing like a pro. You might feel really good about your swing right now, and so you don’t need to tinker with it, which is great. But, over time, your body changes and with those changes you will need to adapt your swing to order to maximize your performance on the golf course. Whether you are looking for advice today, or for in the future, here are some of the best actions and advice for you to upgrade your golf game to swing like a pro. The first step for you towards having a swing like a pro is figuring out how to correctly address the golf ball. You need to find the right spot of where to place the golf ball between your feet, and how far out does the golf ball need to be. The general rule of thumb is for you to place the golf ball towards your front foot when you are using a driver or a fairway wood. When you start going down to your irons, you need to place the ball in the middle of your stance. In addition to this, the longer the club, you further out the ball needs to be from your body. Your arms should be out at a comfortable angle, where they are not too high or too low. Your elbows should be locked, and the angle of your arms should be somewhere between 25 and 35 degrees. Lastly, your feet should be pointed in the direction you want your golf ball to go; if your hit an errant shot, the first place you should look is your feet, and more than likely, you will see the line your feet make goes directly to where the golf ball went. Once you are all squared up in your stance, you can move onto the next section. As you start swinging the golf club backwards, you should start rotating your shoulders back with the club and your hips should also start shifting at the same time. Even though your weight should be evenly distributed when you start your swing, this will not be the case once you complete your swing. You should do this until the golf club is at a 90 degree angle with your leading arm. Your leading arm at this time should also be parallel with the ground, as this will give you the smoothest possible motion with your stroke. When you have reached the optimum point, a portion of the golf club should be pointing down directly at the golf club. 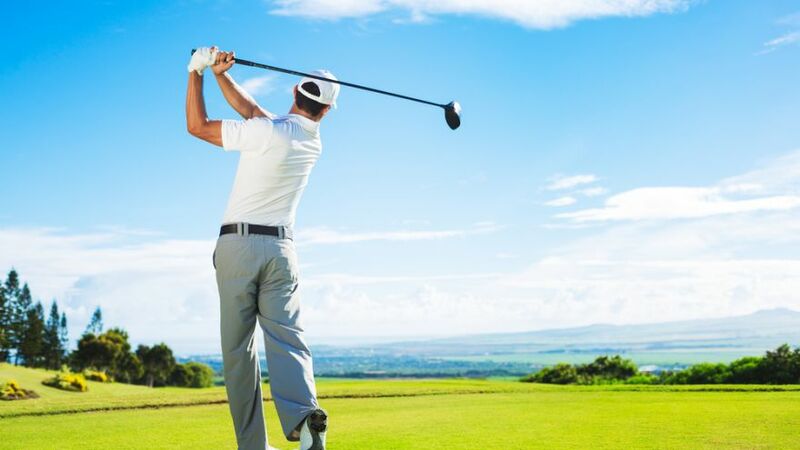 However, this is not always the most comfortable position for everyone, so you should take the golf club back in your swing until it feels the lightest, and don’t go any further than that. This might be only around 60 degrees for some, yet others might be able to torque their bodies to reach an angle higher than 90 degrees. Just make sure the club feels light at its apex, and you’ll know you found the sweet spot. Once you have reached the apex, you will start moving the golf club in a forward motion. Right before you do this, you should start rotating your shoulders back to the square position you started in. You have to keep your wrists locked. If you bend your wrist, the golf club will move around in your hands, which will cause the club face to not hit the ball square. You also *MUST* keep your head down and focused on the golf ball. Once you take your eyes off the golf ball, your club will either top the golf ball, or hit the ground first where you will take out a chunk of ground rather than hitting the golf ball. As you bring the golf club forward, once you reach the point of striking the golf ball, your body should be fully squared up like you were when you started your backswing. If any part of your body is in a different position than when you started, then your golf ball will go in an errant direction. When you strike the golf ball, there will be some impact felt within your hands. If your hands receive a sting anytime you hit the golf ball, this means that you did not hit the sweet spot of the golf club, as well as not gripping the club correctly. Learning how to best swing the golf club based upon how your body is currently can be a tough thing, which will take some practice. Once you find the right swing, though, you will on your way to swing like a pro. 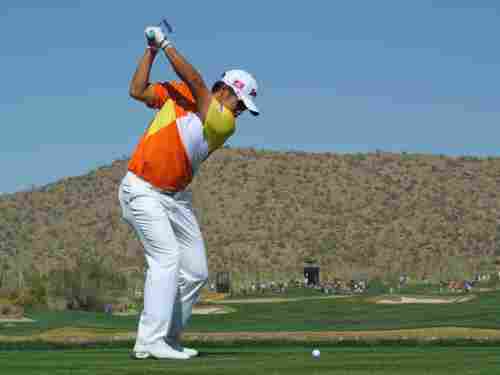 Just remember one other note – this kind of swing is only for those shots which are a longer distance. The closer you come to the pin, the less your body should rotate; those swings take more finesse, so you can ensure you don’t power the ball too hard. However, that is a lesson for another time. 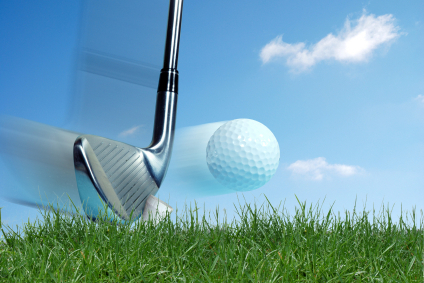 In the meantime, we wish you luck in fine tuning your swing, so you can go out to the golf course and swing like a pro!